I'm really excited to be giving away 9700 FREE EverStryke matches as our way of introducing you to SurvivalLife.com. 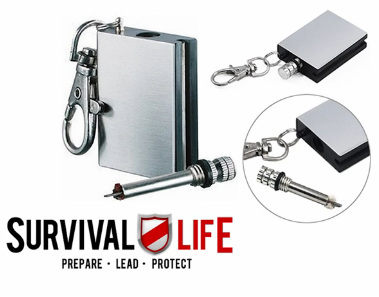 Like the video says above, this is the coolest survival tool you've ever seen. So far we have already shipped more than 8683 of these matches in the last few days and we are QUICKLY running out, so grab yours now while supplies last. This clever tool is an invaluable, possibly life-saving utensil that is equally at home in your wallet, purse, bug-out bag, toolbox, or even the kitchen drawer.Grab one today to make sure that no matter where you are, you're never more than an arm's length away from a fire source. PLEASE NOTE: You must be 18 or older to purchase this item. The bearer of Everstryke Match accepts all responsibility for their use or misuse. FREE BONUS #1 Revealed on next page after sign in below. FREE BONUS #2 Revealed on next page after sign in below.